Happy Monday – I hope you all had a wonderful weekend! Life has been busy over here as we finish out the school year and settle into a summer routine. 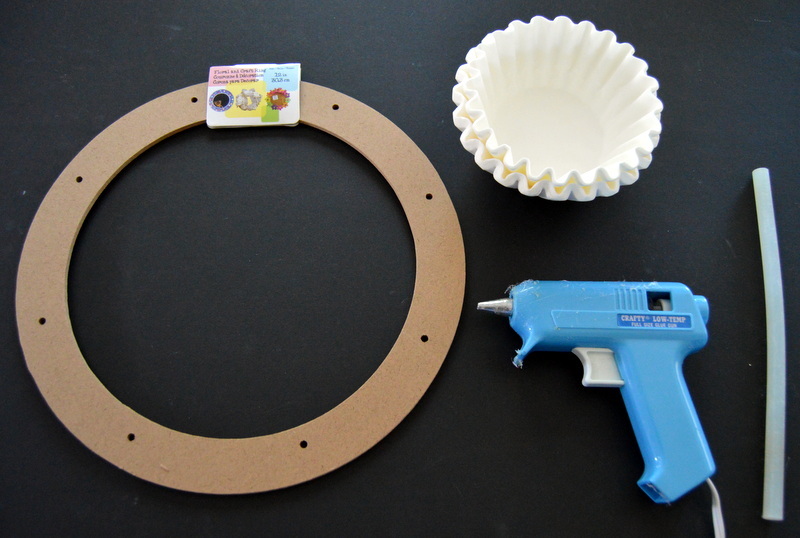 I haven’t had much time for crafting, but in honor of a fun giveaway I’ll be hosting soon on Instagram, I decided to make a quick, easy, and inexpensive coffee filter wreath. 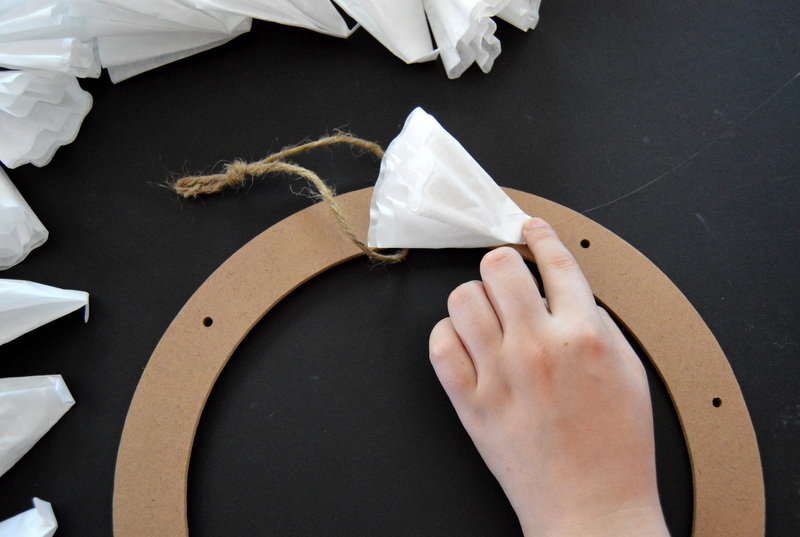 I know there are a million tutorials already floating around blogland, but I still get asked so many questions about my little wreath that I figured one more tutorial won’t hurt. 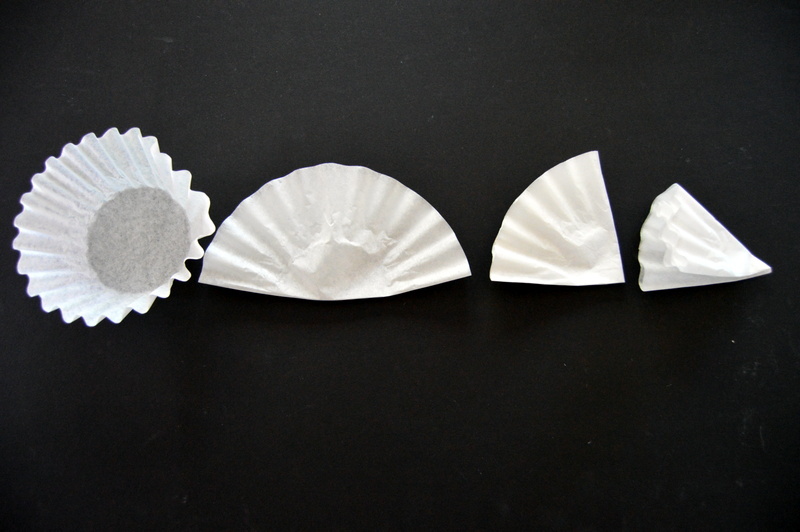 The first thing you will want to do is flatten your coffee filter just enough to fold it in half easily. 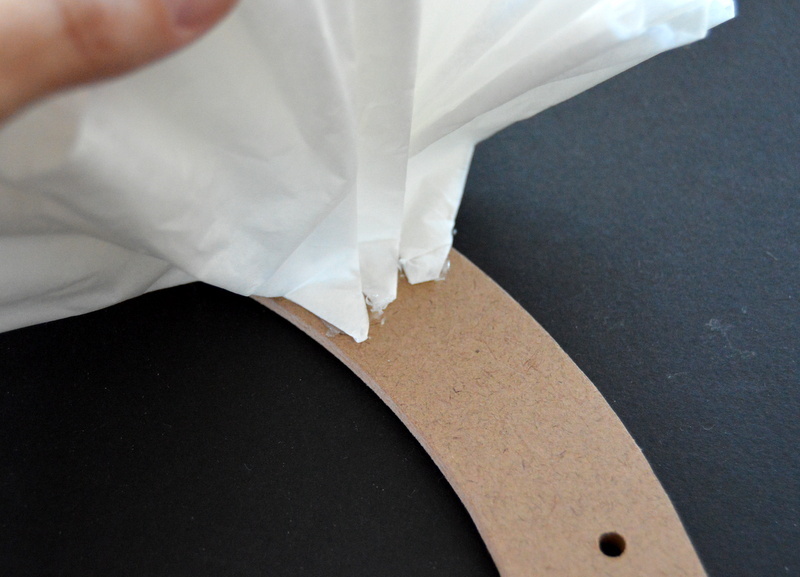 Then you will fold it in half again. Then one more time. 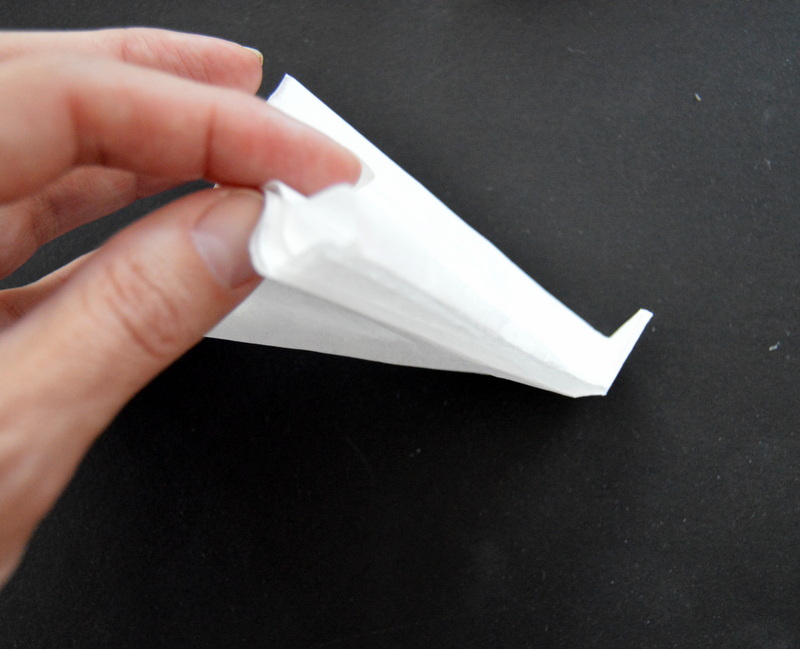 Next, fold the pointed end about 1/2 inch from the tip. This is the end that will get glued to the wreath form and I found that bending the end just makes the glueing/sticking process easier. 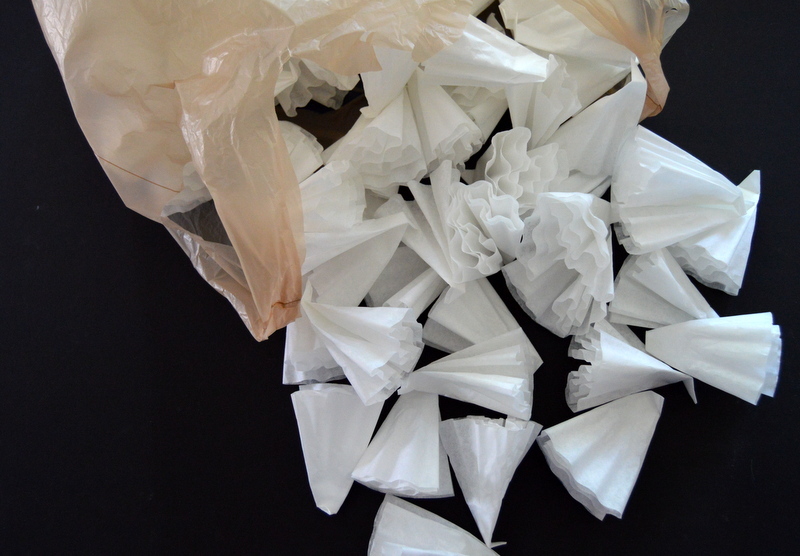 Go ahead and fold all of your coffee filters. Turn on Netflix and chill on the sofa, this will take about an hour to do. 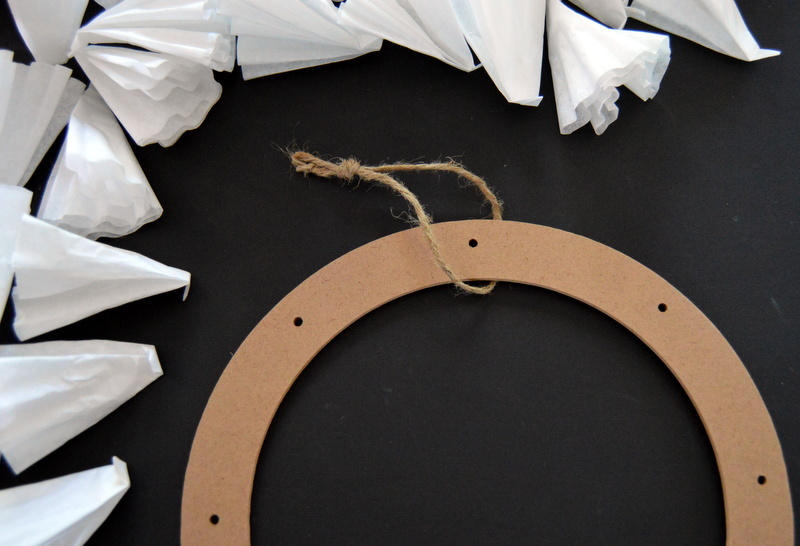 If your wreath form is larger, plan on spending a little more time. 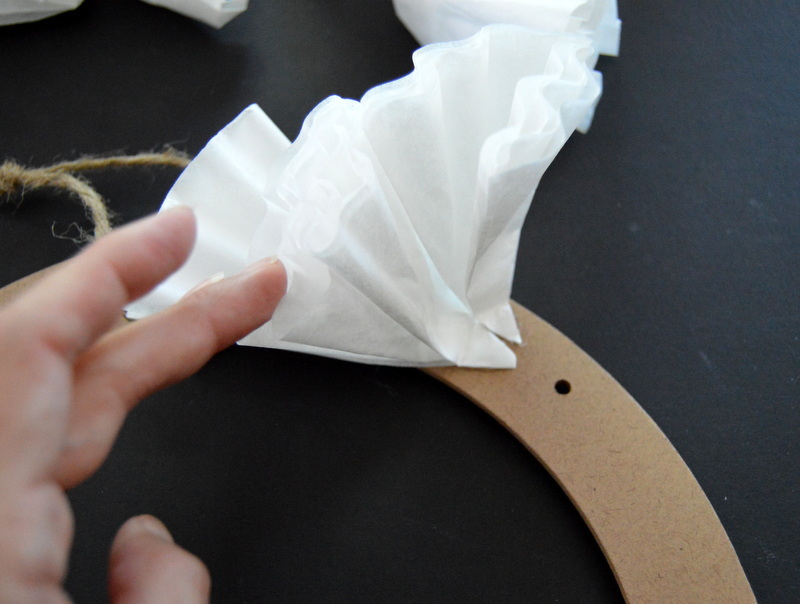 Once your filters are all folded, plug in your glue gun. 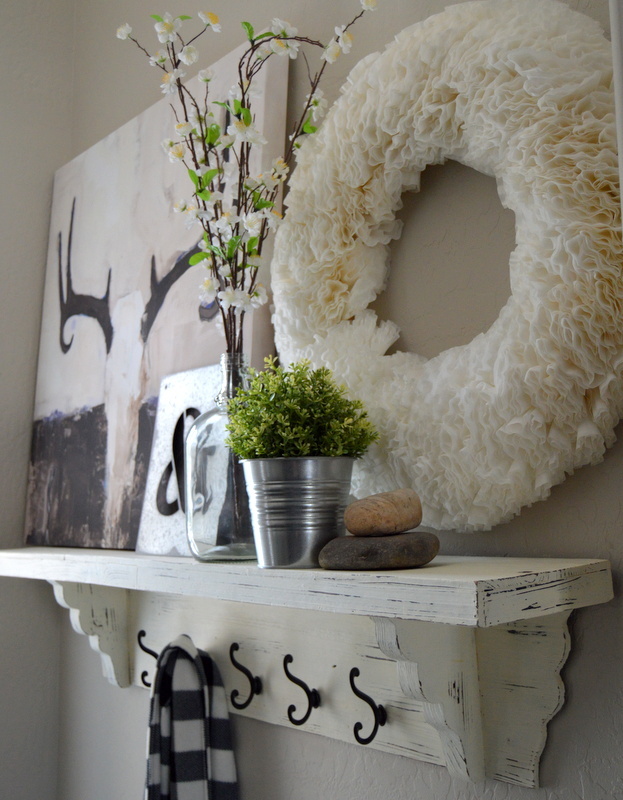 While you wait for it to heat up, take your twine or ribbon and tie it around the wreath form. This will be your “hanger”. 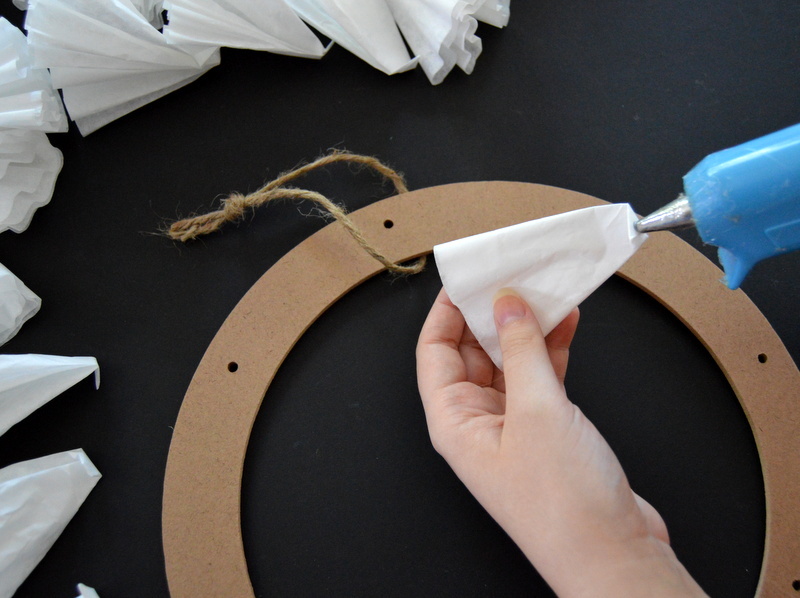 Once your glue gun is ready, put a little dot on the folded end of your filter and stick it on the wreath form. For this particular wreath form I was able to work in rows of three (as pictured above). Begin your next row just below your last, so that the rows are touching, but not over-lapping. Meake sure your tips are all facing the same direction. Continue the process until the wreath is full. 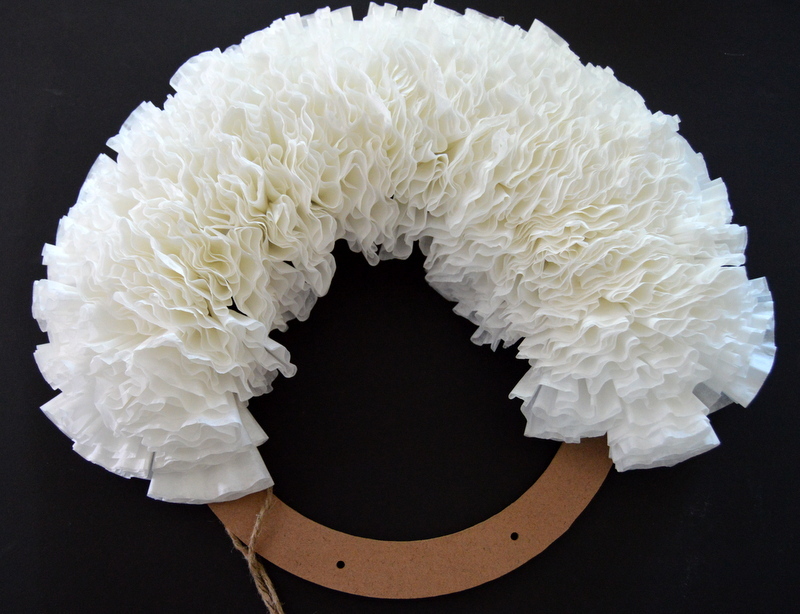 Once you are finished gluing all of the filters onto the wreath form, fluff and adjust the filters as necessary to cover any bare spots. You may need to add a few filters here and there to balance the wreath out but, that’s really all there is to it! The entire process took less than two hours and cost less than ten dollars! 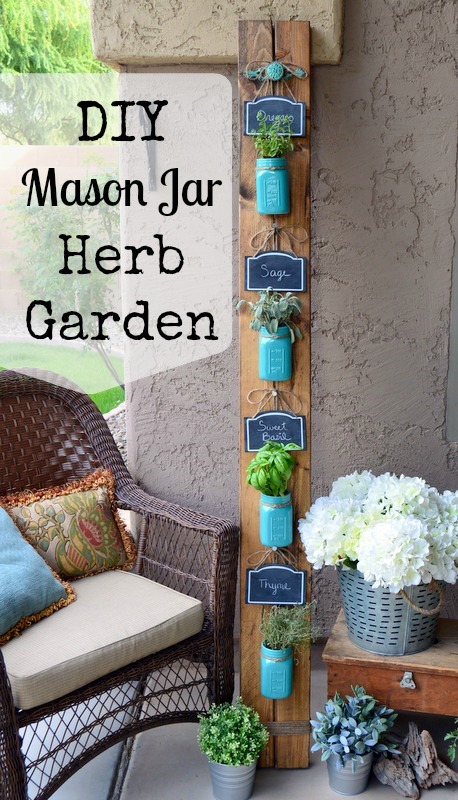 You know how much I love a cheap, easy project! I’d love to hear your thoughts on this project; you can connect with me here on the blog, on Instagram, or Facebook! Oh Amy, I am in LOVE with this wreath you made! It is so pretty! Thanks so much for sharing the tutorial, which is definitely getting pinned for later! Thank you so much, sweet lady! This is one of my favorite projects to do! I love this wreath and I am thinking how much fun it will be to plan a Sunday fun day with a few friends and make this wreath together! I also love those longhorns in the picture, would you mind me asking where did you find them? Where did you find the wreath form? I found it at Michaels – don’t forget to bring a coupon! This would be the perfect project to do with friends! I found the picture at my local grocery store (Fry’s/Kroger), of all places, but World Market also sells it. Good luck, and have fun! My mother in law just made me one of these and she gave me little seasonal decorations to stick in there for different holidays. So cute! That’s a great idea! I’ll have to try that, too! Thanks so much for stopping by! You’re welcome! So glad you found this tutorial useful! Very pretty, Amy! I might just have to make one! Have a wonderful weekend! 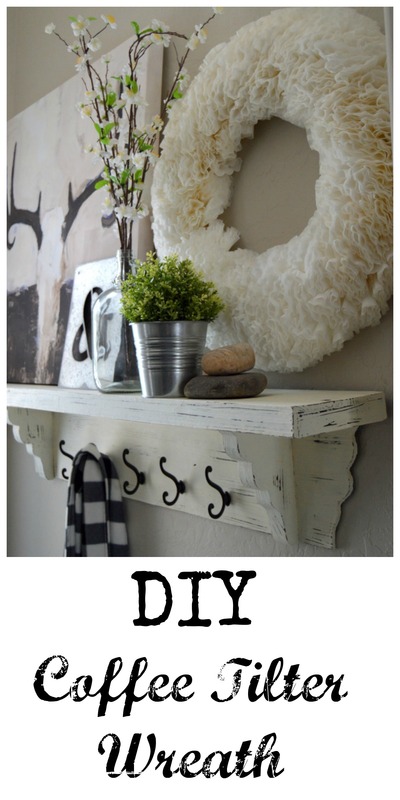 Thank you, Kendra – this was so easy to make! Shut up!! This is so awesome. :) I’m always over-complicating things. 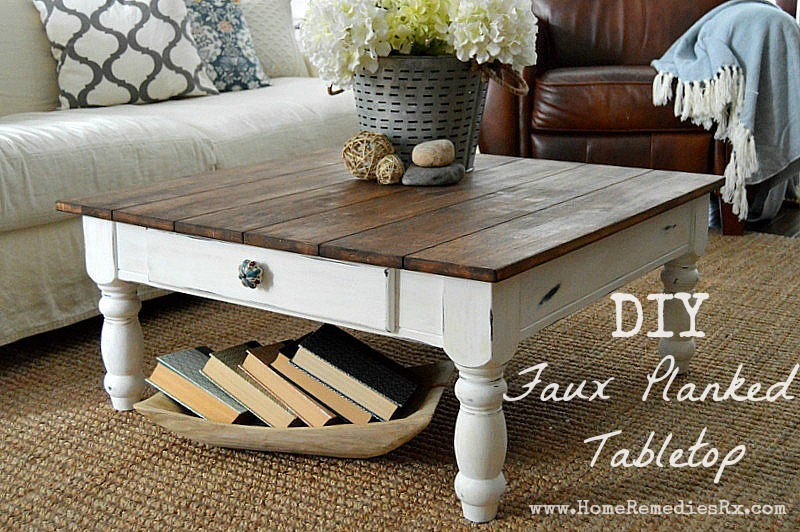 This one is definitely on my DIY list. I’m always so drawn to what you link up! As usual your project and photography is beautiful, Amy. Sharing this as one of my favorites tomorrow at our party. Hope you’re having a great week! Oh wow! You are too sweet to me, Jamie! Thank you so much for featuring my project – it really means a lot to me! 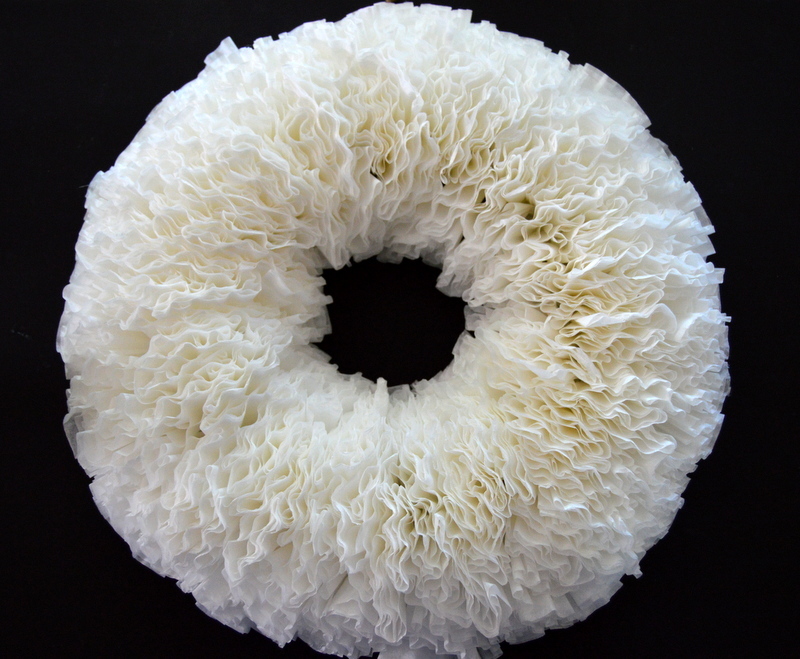 Love the coffee filter wreath.Going to try it.Thanku so much for sharing! Getting supplies now. Did you use 8 cup or 12 cup filters? I used 12 cup filters – have fun!